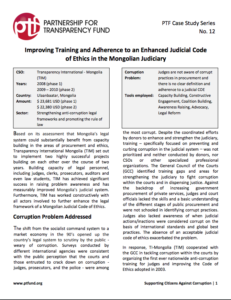 Based on its assessment that Mongolia’s legal system could substantially benefit from capacity building in the areas of procurement and ethics, Transparency International Mongolia (TIM) set out to implement two highly successful projects building on each other over the course of two years. Building capacity of legal personnel, including judges, clerks, prosecutors, auditors and even law students, TIM has achieved significant success in raising problem awareness and has measurably improved Mongolia’s judicial system. Furthermore, TIM has worked constructively with all actors involved to further enhance the legal framework of a Mongolian Judicial Code of Ethics.